We got our new location in Wall, NJ. Take a look at the new plans on our Layout page. 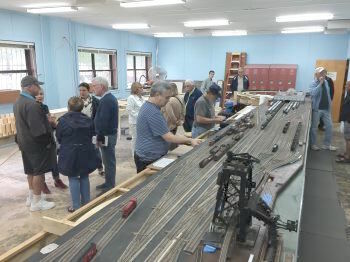 You can still see pictures of our former HO-gauge layout in Asbury Park, with a 300 foot mainline which traversed four rooms. 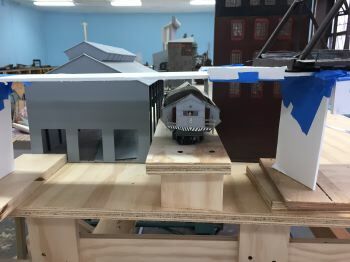 The railroad featured prototype scenes of the Lehigh Valley, Central Railroad of New Jersey (CNJ), Reading and Erie railroads, modeled after actual places along our route from Scranton, PA to Jersey City, NJ. 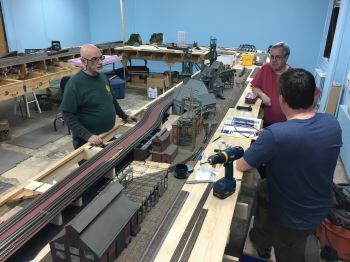 The layout featured the huge Bethlehem Steel Mill in Bethlehem, PA -- a fantastic model built almost entirely from scratch! Trains roll past the REA building and the infamous Coney Island Texas Weiners in Scranton, past the well-known blue tank in Allentown and call on the docks of Jersey City complete with it's operating McMyler coal dumper... all in 1:87th scale! 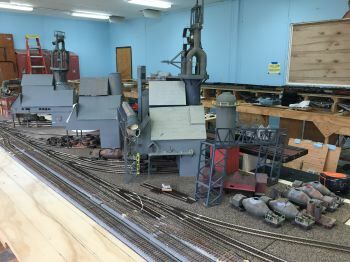 Sadly, we lost our home and this layout is gone, but we were able to save a lot of scenery and building from the old layout. We can't wait to get started on our next one! If you want to keep up with our changes, join us on our Facebook page. 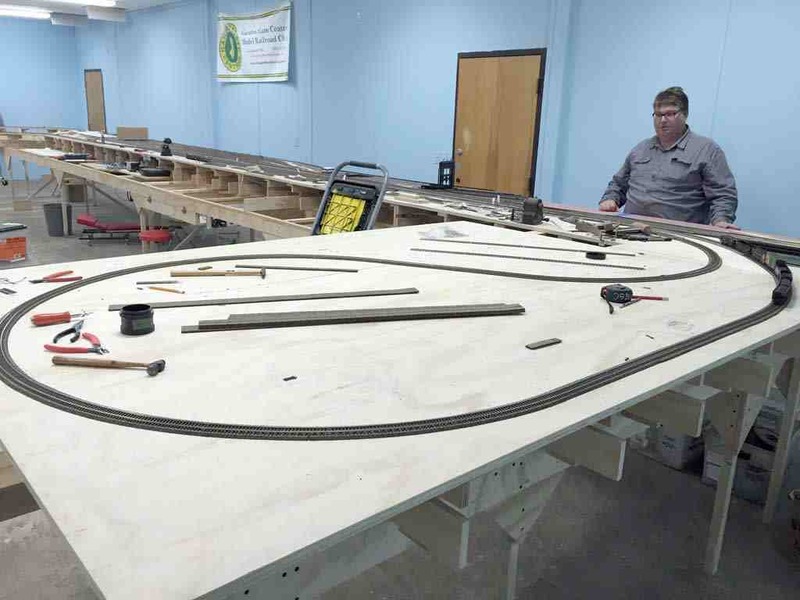 Time for us to open up our layout room to the public. We'll be open on Saturday, May 4th from 1-5 pm. 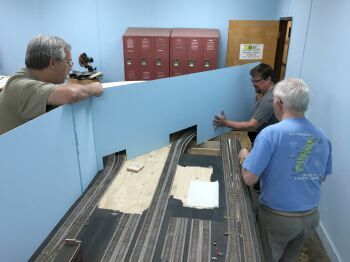 Stop by and see our operating layout and museum room. There's a $7 admission fee for the InfoAge museum. The admission fee gives you access to all the InfoAge museums as well as our model railroad. A Quick March 2019 Update. Next up is some operations on the layout. We finally get to play with what we've been working on for the last three years! 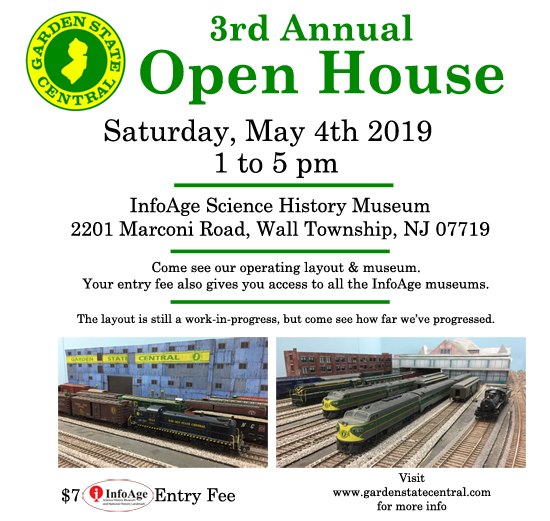 PS - Our next open house will be in early May. Details will be posted in early April. 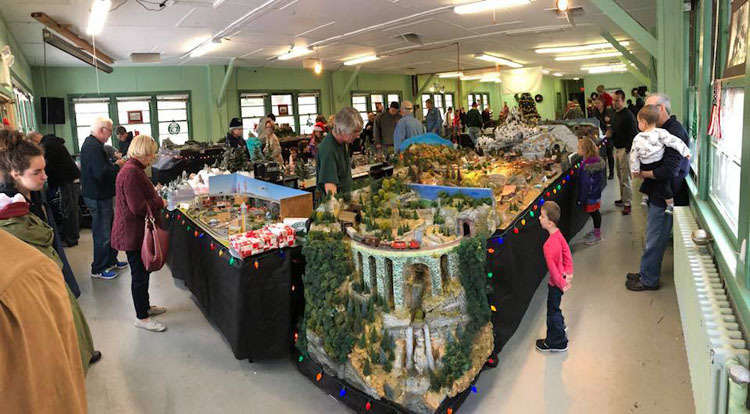 Thanks again to everyone who visited our Holiday Train Show, and a really big thanks to all those who dropped off a Toys-For-Tots toy. 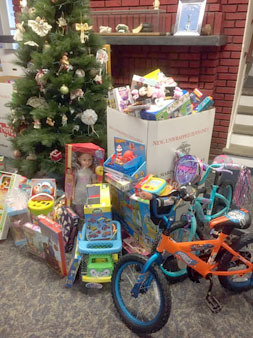 This year we collected around 400 toys for families in Monmouth County. Now to start working on the layout again. The Wilkes-Barre area is feeling neglected after the holidays and wants our attention. 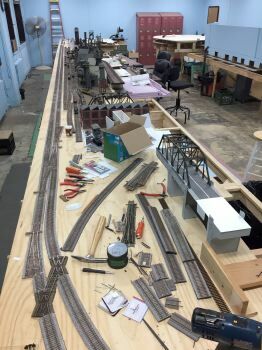 Its been a busy summer, and we haven't had a chance to update the layout pictures. If you follow our Facebook pages, you may have seen a few of these before. As of now, the mainline from Jersey City, through Easton to Wilkes-Barre is completed. See more pictures. Well, in order to lay the mainline track through the Bethlehem Steel area, we needed to know the correct alignment through Easton. The only way to do that was to move the temporary loop and put the Easton section in. Now the loop is on the west end of Beth Steel. See more pictures. Now back to working on Beth Steel. We've just begun working on the high line that runs behind all the blast furnaces. This is dual gauge (broad and regular) track that all the rail equipment ran on to bring raw materials to the blast furnaces. We realized that some of the pictures had been put up on the Facebook pages, but not all of it was on our web site. This update will rectify the situation. And now you're all caught up. Ah.... Now that the 2017 Holiday Show is over, we can finally catch our breath. 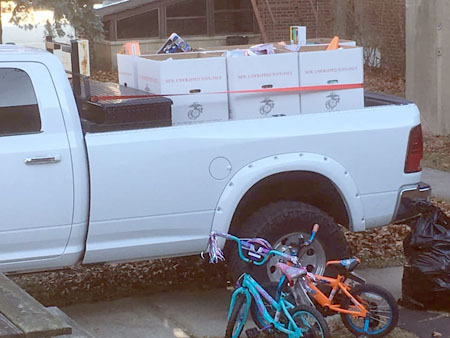 Once again, thanks for showing your support and a big thanks for the visitors who dropped of over 300 presents for the Marine Corps Toys-For-Tots. I'm sure the children appreciate it, I know that the Marines were happy. Next week we can get back to work on Bethlehem Steel. 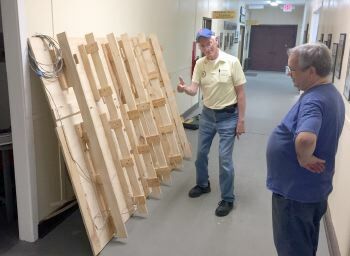 The layout crew was getting too much attention, so this month we focused on the crew making the push-button display layout for our Museum room. They've been working on this for months, and we realized that they haven't had any pictures of their progress on the website. My appologies. Here's all the progress they've made. We've made so many changes to the plans for our layout that we thought it was time to put the newest version online for everyone to see. Enjoy. Take a look at all the plans. Thanks to everyone who came out for Veterans Appreciation Day at InfoAge. We all had a great time. 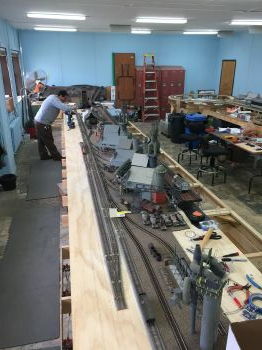 Its been a busy month on the Bethlehem Steel side of the layout. 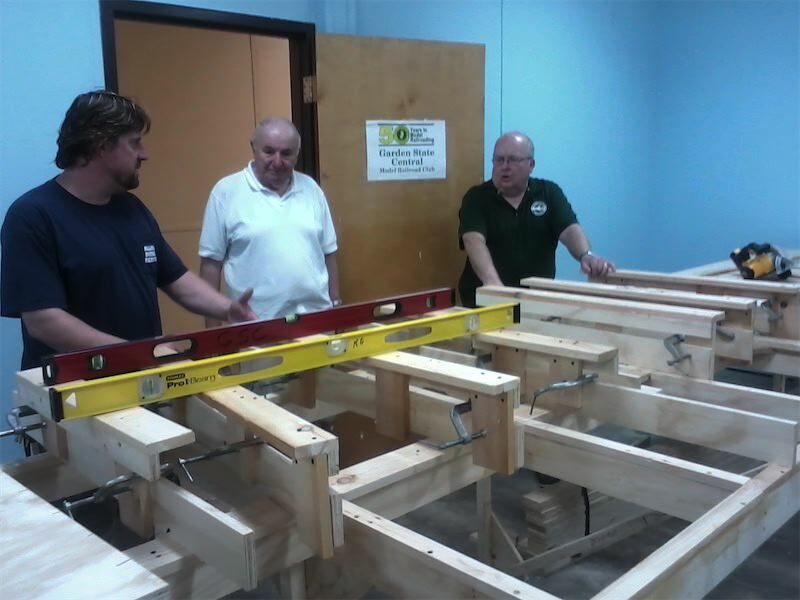 In the last two months we been able to finish the benchwork on the Phase 2 expansion. Some of the building from the old Asbury Park layout came out to give us an idea on what will fit in the new section. 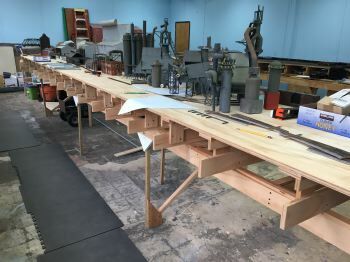 To be honest, it all will fit, since we're going from about 12 feet of Beth Steel on the old layout to about 45 feet on the new layout. :) Take a look at all the pictures. 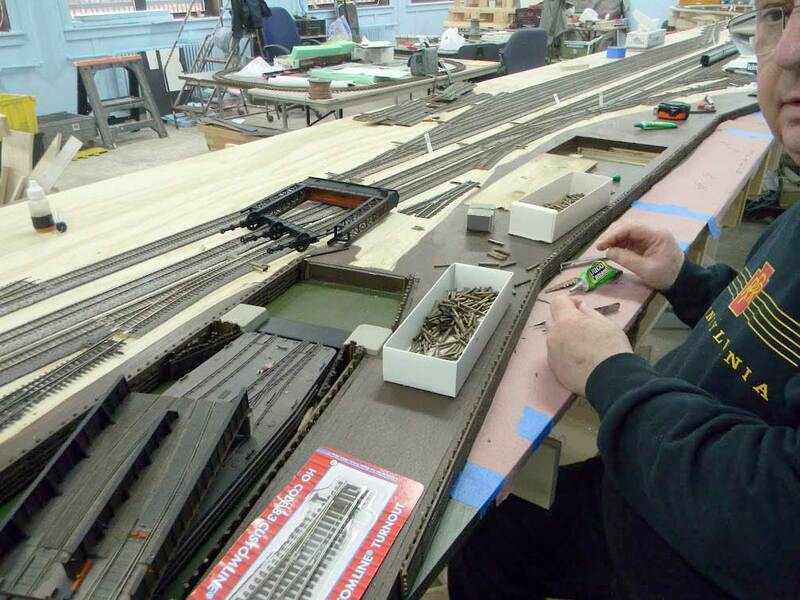 Now that the track plans for Bethlehem Steel have been aproved, its time to start work on Phase 2 of the layout. 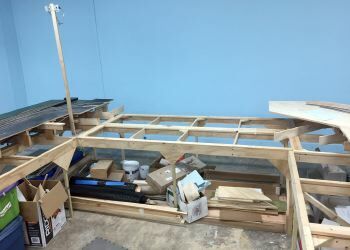 We started putting up the new box frames to support this leg of the layout. Take a look at all the pictures. We'll also be open again to the general public on Saturday, May 20th, 2017 as part of InfoAge's Veterans and Armed Forces Appreciation Day. There will be an enterance fee of $5 for adults and $2.50 for children. 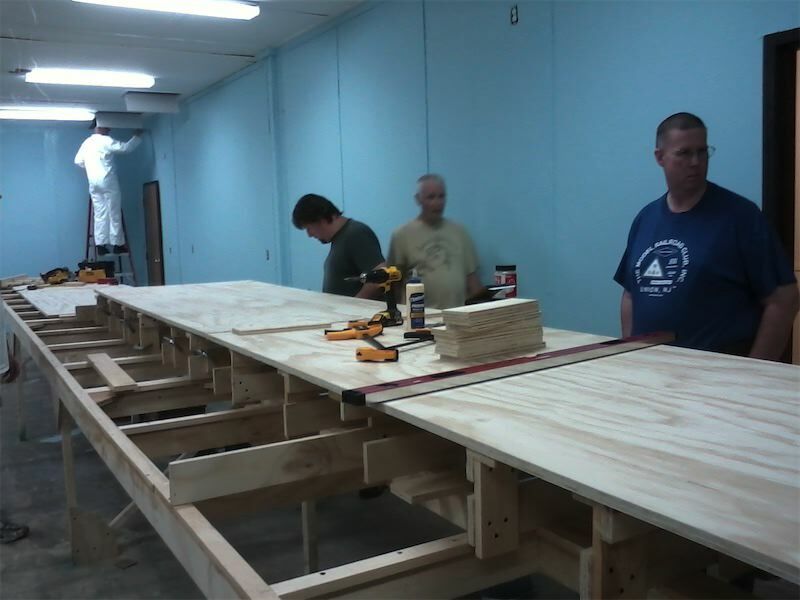 Stop by and see our progress! All of the displays at InfoAge will be open. Well we really pushed hard to have as much set up and running for the May 2015 open house. Here's a look at what we accomplished. 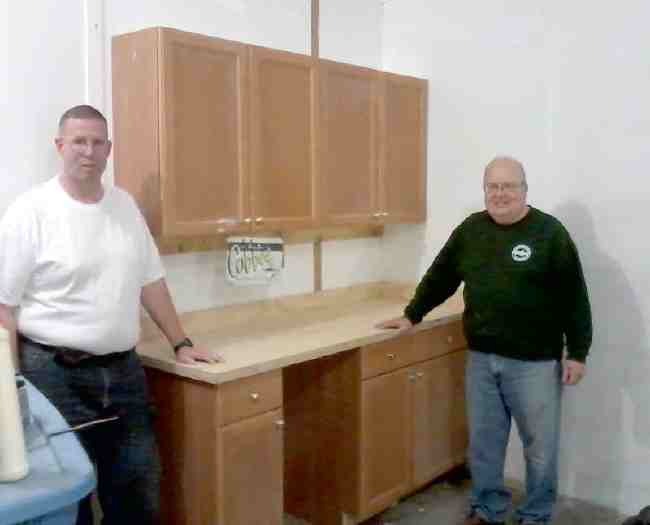 All of our visitors seemed happy to see the progress we made. Take a look at all the pictures. In February, there were a lot of little projects under way. Some of them even got finished. :) Take a look at all the pictures. 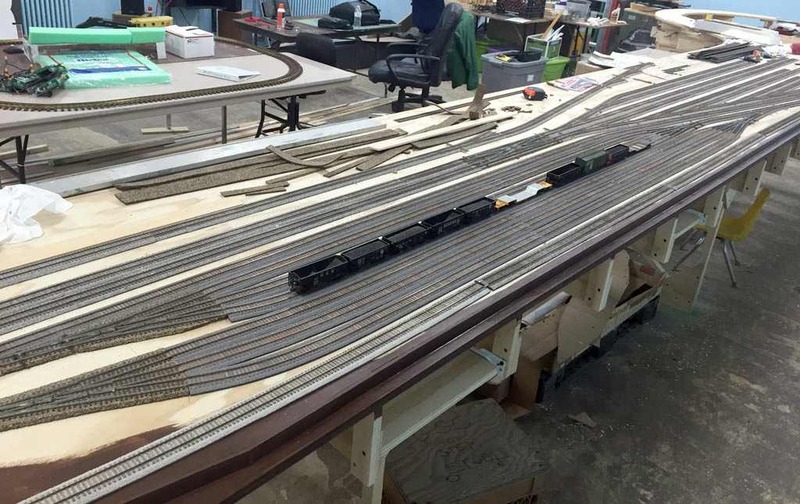 Now that the 2015 Holiday Show has finished, we finally got back to work on the layout and the Museum room. As you can see, the temporary loop went in, now we just have to wire it. Take a look at all the pictures. 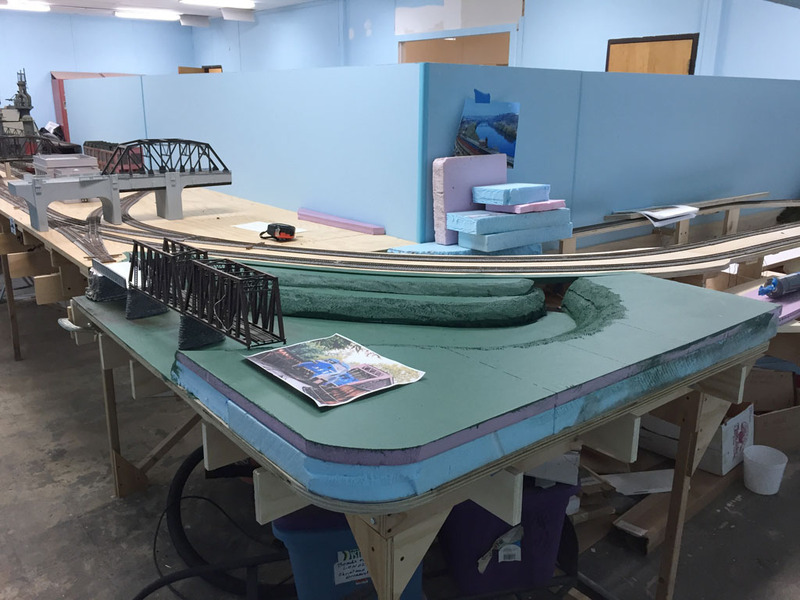 This month we were starting to wire up the mainline track and adding all the pilings and cribbing along the edge of the layout. Take a look at all the pictures. 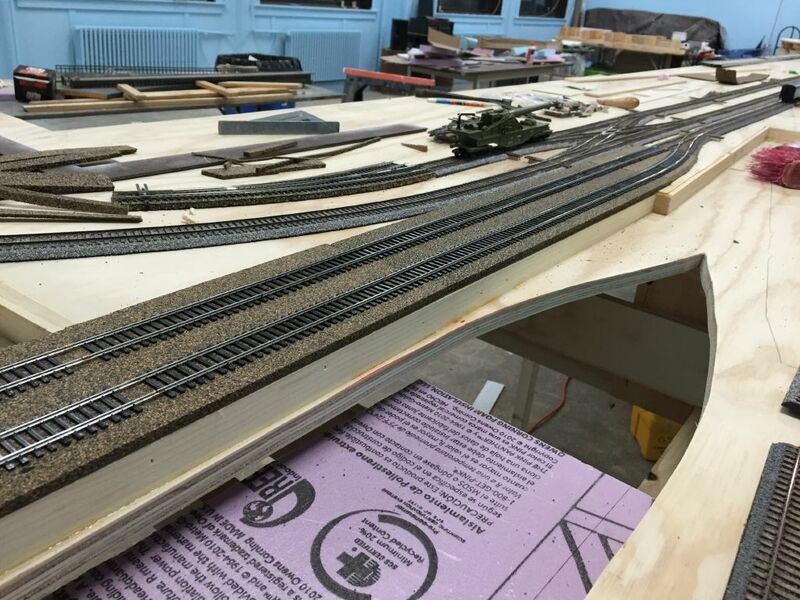 Moving right along... All the track on the aisle side of the layout is complete, except for the lead up to the coal dumper. Take a look at all the pictures. Track, Track, Track. The track is finally going in. 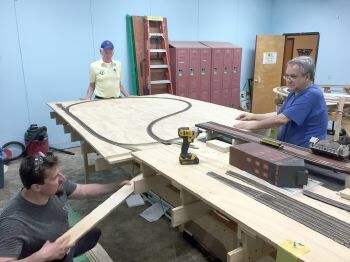 It's starting to look like a model railroad again, not the plywood central. Take a look at all the pictures. This month, we worked on cutting out the water areas from the layout deck and lowering them to their final height. It took a little while, but it was well worth it. We also put in the return loop deck. 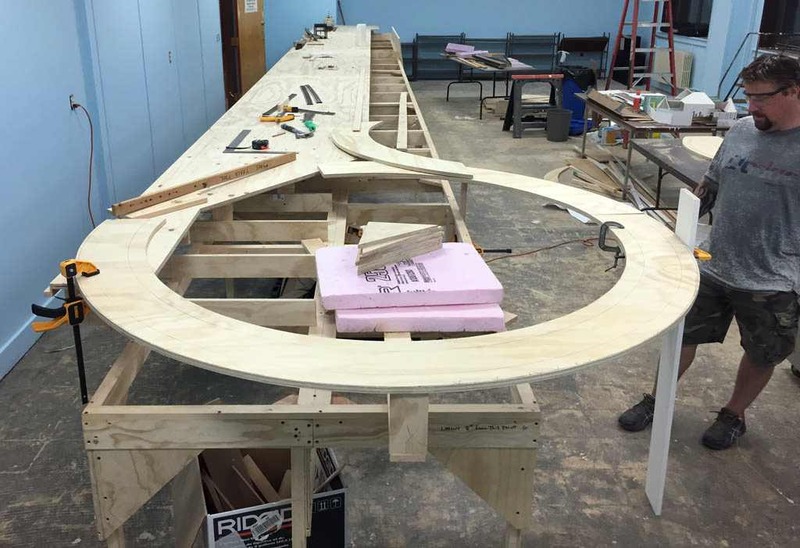 Next month we can finally start laying track. Yea! Take a look at all the pictures. half should go up in the next week or two. We're shooting for track installation in August. Take a look at all the pictures. The crews have been busy the last few weeks. 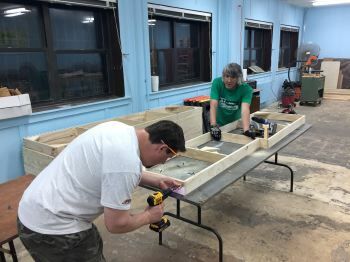 One group is touching up the wall trim and paint, another is setting up the Coffee Station (no pun intended) and others are roughing out the track locations on the layout. Take a look at all the pictures. 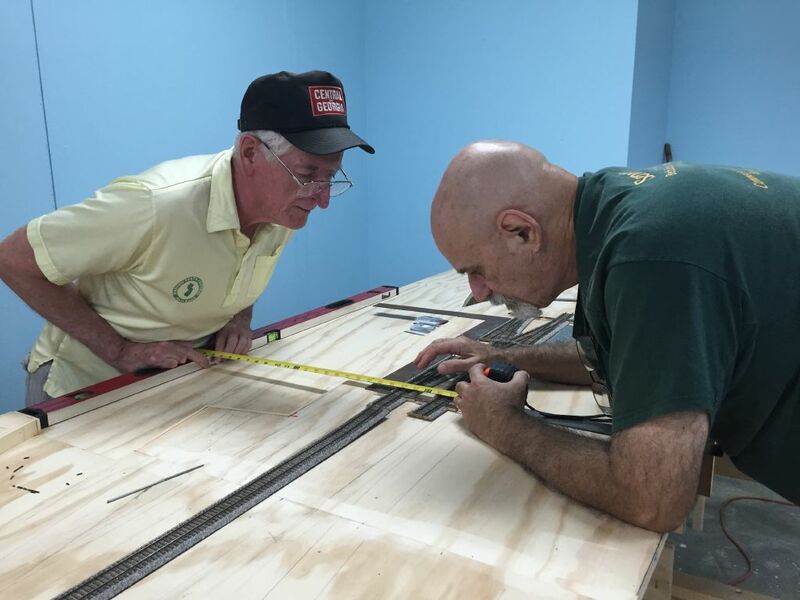 Jimmy and Jules started aligning tracks on the layout with help from a few other members. 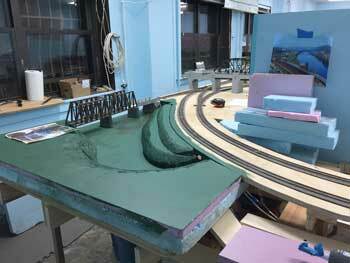 After the track is all roughed in, we can trim the layout deck, put in the risers and start actually laying track. Yea! 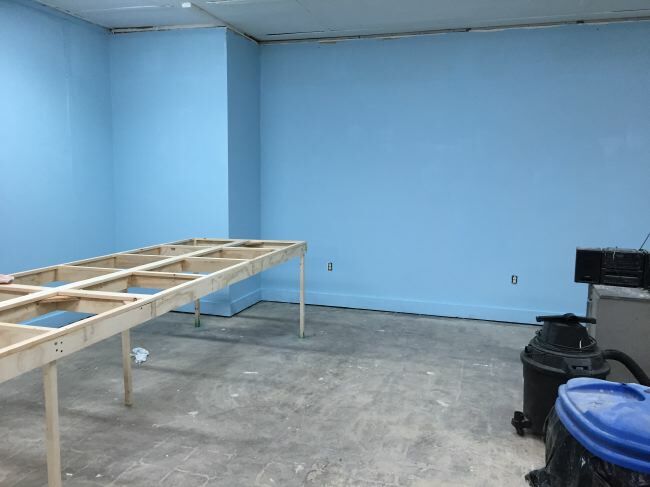 After adding caps to the layout box frame to complete it, we started painting the room. Not a very exciting picture for you, but we're happy to not have to look at patched walls and spackle anymore. Take a look at all the pictures. 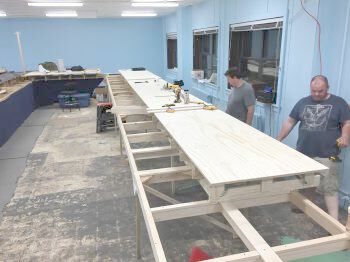 Mike and Jimmy put the bracing on the layout over the weekend to finish the box frame. 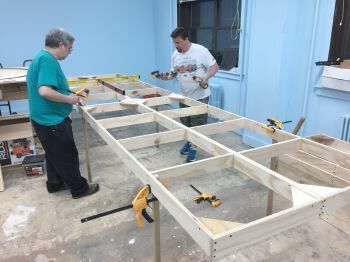 After we put a second coat of paint on the walls, we can work on the risers and layout deck for the Jersey City side of the benchwork. That should be the beginning of June if all goes well. Wow, this sure took long enough. 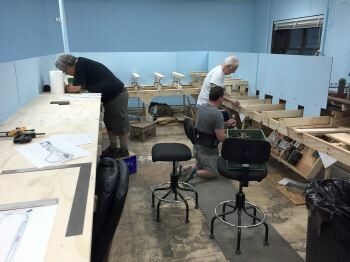 We've finally started the benchwork for phase 1 of our new layout. The box frames that will support Jersey City, NJ on one side and Taylor, PA on the other are finally up. Take a look at all the pictures. 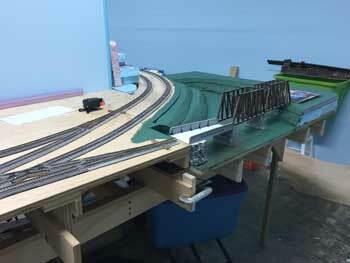 Next is to attach the L-girders. Then we can put the risers and track support on top. Jersey City gets built first, then the temporary helix to raise the track up to the higher level of Taylor, and finally we work on Taylor. That should give us enough to do for the time being. 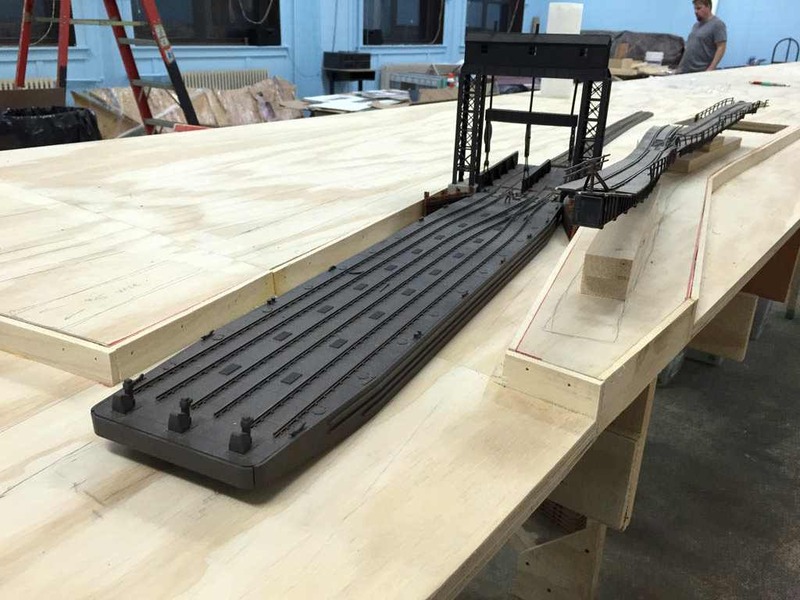 We have the track for Jersey City's mainline and are awaiting the yard trackage in the next few weeks. Now if they would only finish the lights in the room, ugh. 40 foot down, 60 more to go in phase 2.